Metamorphis - This picks up where the Chopper Saga ends. If you had asked anyone who had known me in my Chopper Days, myself included, which would be more likely in my future - a prison sentence or a PhD in Engineering, we would almost certainly have gotten it wrong. A tale of transformation on many levels. Engineering Adventures - Not all engineering takes place at a desk. 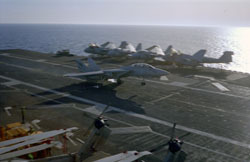 I have had the good fortune to have some interesting experiences on various test jobs, including a week at sea onboard an operating aircraft carrier. Panama Panoramas - We took a trip to Panama in December 2009 to explore and escape winter. This is a series of panoramic images made during that trip. Macro Photography - I've always enjoyed seeing nature on the small scale - this is a selection of some pictures I made with a Nikon D200 and a Macro lens. Mountain Lake - Before and After - Mountain Lake is a natural alpine lake in SW Virginia, and the scene of the movie Dirty Dancing. Because the lake drains through a hole in the bottom, there are times in history when the lake has been completely empty, and now is the first time in many years. Just 4 years ago it was full. These are overlaid photos of full and empty. Home Place Fire - I grew up in rural Maryland in a house that had been built in 1890 - by a neighbor and his father. By the 70's the house was deteriorating, the property had been rezoned industrial, and vandals had begun damaging the now empty house even more. Rather than see the beloved old place suffer further indignity, we called in the local fire department. Freight Train Ride - Ever watch a freight train go by and think about hopping on for a ride? So have I - ever since I was a kid growing up not too far from the railroad tracks. I finally got around to doing it. Steve Cole's Recycle - According to the builder, Steve Cole, "this is what happens when you leave a bunch of parts around a heated garage in the winter". It's built from parts of 15 different vehicles, and ridden year round.